An MIT team is developing a small-scale system that converts natural gas into easily transported liquid fuels—a design especially suited for use at oil drilling sites where escaping natural gas is now burned or vented. To keep the size and cost down, the researchers are performing a critical step of the conversion process inside a conventional, mass-produced engine. And to minimize cost, complexity, and maintenance needs—important for installations in remote areas—they are focusing on producing methanol, a simple chemical with rapidly expanding uses. Extensive modeling studies and engine experiments confirm the technical viability of the process and show that—in some situations—the cost of producing methanol could be competitive with costs at large conventional methanol plants. A pilot-scale demonstration of the system will begin soon. When natural gas emerges from oil wells, it’s often burned off (“flared”) because there’s no economical way to transport it to market. Worldwide, the total amount of flared natural gas is estimated to equal a quarter of total US consumption. In nighttime satellite images of Nigeria, Russia, and North Dakota, burning gas looks like bright city lights where they don’t belong. Flaring puts greenhouse gas into the atmosphere and wastes valuable resources—a special concern when people nearby may be using coal, biomass, or dung for cooking and home heating, often with serious indoor air pollution and health consequences. Companies now operate plants that convert natural gas into liquid fuels that can be moved by truck, train, or ship. These plants are technologically sophisticated, capital-intensive, high-maintenance, and—to keep product costs down—large in size, especially when producing certain types of diesel. As a result, they’re not suited for deployment at remote sites where natural gas yields are small. To address that problem, Dr. Leslie Bromberg, principal research engineer at the Plasma Science and Fusion Center, Dr. Daniel Cohn, research scientist at the MIT Energy Initiative, and a multidisciplinary team of MIT collaborators are developing a small-scale, low-cost, low-maintenance “gas-to-liquids” conversion system. While economies of scale favor large plants, they’re bringing down per-unit cost using a different approach. “Instead of making plants large, we want to save in production costs by using things that we already make lots of,” says Bromberg, the project leader. Their target is the reformer, a device that converts natural gas or biogas from organic sources into a mixture of carbon monoxide and hydrogen called synthesis gas, or “syngas”—the feedstock for the chemical reactor that produces the desired liquid product. Their plan: to replace the usual expensive reformers with a small, well-developed technology that’s mass-produced—namely, the ubiquitous engine—and utilize “engine reformers” to reduce the costs of other components of the overall system. Demand for methanol is expected to grow rapidly in the next decade. Today, it’s widely used as a feedstock for producing other chemicals. In China, it’s made from coal and used in vehicles in a low-concentration blend with gasoline. It’s slowly gaining attention as an alternative to gasoline, and it can easily be converted into dimethyl ether (DME), which can serve (much like propane) as a clean fuel for cooking and home heating and potentially for operating the trucks and tractors that are so common in parts of the developing world. 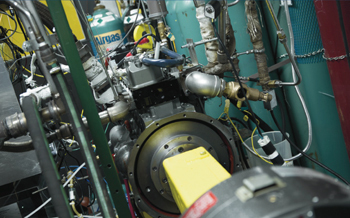 In this novel system, natural gas is cleaned and fed into a small compressor, where it mixes with oxygen-enriched air. The fuel-oxygen mixture then enters the engine reformer, where high pressures and temperatures inside the engine cylinders drive chemical reactions that form syngas, a mixture of hydrogen and carbon monoxide. After its temperature and composition are adjusted, the syngas is fed into a reactor where it’s catalytically converted into methanol, the desired liquid product. Excess mechanical energy from the engine reformer drives the oxygen-enrichment unit and under some conditions a small syngas compressor. The syngas from the engine reformer is relatively close to the pressure required by the methanol reactor, so there’s no need for a large, high-cost compressor. To determine the technical and economic viability of their novel idea, Angela J. Acocella, a graduate student in the Technology and Policy Program, and the MIT team performed an analysis of the engine reformer in the context of the entire methanol-production system. The figure and caption above describe the components and flows in their proposed system. As a basis for their system study, the researchers assumed an engine reformer that would produce enough syngas to make 30 metric tons per day of methanol (the energy equivalent of 100 barrels of oil per day). That level of operation would require roughly 1.5 million standard cubic feet of natural gas per day. About 40% of all oil wells generate “associated” natural gas at or above that level, so it seemed an appropriate starting point for analysis. A central question is whether such an engine could produce syngas suitable for the methanol reactor. In standard engine operation, the air and fuel mixture is adjusted so that all the fuel will burn up, producing carbon dioxide and water. But since syngas is the intended product here, the engine must operate with more fuel than air so that combustion is incomplete. The challenge is that running an engine sufficiently “fuel-rich” could cause it to misfire—or it could not fire at all. Using their models to simulate engine operation, the team—with support from Professor William H. Green of chemical engineering—determined that a conventional spark-ignition (SI) engine could be run with an exceptional amount of excess fuel. The keys to their success: preheating the incoming mixture and raising the fraction of oxygen in the air. According to the analysis, with those changes plus some adjustments in valve and spark timing, the SI engine will run sufficiently fuel rich to obviate the need for a large compressor to pressurize the syngas upstream of the methanol reactor. In addition, the ratio between hydrogen and carbon in the syngas will be close to optimal. As expected, component costs and operating and maintenance expenses (per unit methanol produced) are higher with small-scale systems than with large, conventional ones. But the small MIT system has an important economic advantage. While large units are specifically designed for a particular site (thus, one-of-a-kind), the small system could be mass manufactured at a central location and then deployed to the site, bringing down construction costs. (According to Bromberg, the units should be small enough to fit in two or three skids.) And, while large plants need constant attention by on-site maintenance teams, the small system could be monitored remotely—again, a considerable savings. Overall, assuming the present price of natural gas, the projected cost of producing a gallon of methanol using the MIT concept is about $1.70, which is around twice the cost at a large plant. However, at sites where gas is flared, the small system could be supplied with natural gas at substantially reduced or no cost, especially when regulations are put in place to prevent flaring. Assuming free gas, the overall cost of producing methanol using the engine reformer technology drops to about $1.00/gallon, which is lower than the present world market price and lower than the cost of producing diesel fuel (on an energy basis). An additional economic benefit comes from reduced fuel transportation costs when the methanol is used near where it’s produced. Acocella is now examining potential uses and local production costs for methanol and DME, particularly in developing countries. A major focus is Africa. For example, in Nigeria, large quantities of natural gas are flared and the need for clean fuels is critical. Other collaborators include groups in India and in Australia, where there is significant interest in converting natural gas to DME for use in slightly modified diesel engines. Encouraged by their early modeling results, the researchers have been performing parallel engine experiments in MIT’s Sloan Automotive Laboratory. Working with Wai K. Cheng, professor of mechanical engineering and head of the Sloan Auto Lab, Kevin Cedrone SM ’10, PhD ’13, a postdoctoral research associate in the Plasma Science and Fusion Center, adapted a power-generating marine engine for the experiments. In ongoing tests, Cedrone, Emmanuel Lim, a graduate student in mechanical engineering and a fellow in the Tata Center for Technology and Design, and undergraduates Thomas Needham ’17 and Raul Barraza ’15 of mechanical engineering carefully regulate the injected mixture of methane (the fuel) and air and examine the composition of the exhaust. As predicted in the analysis, they’ve found that by raising the temperature and oxygen content of the incoming mixture, they can run the engine with substantial amounts of excess fuel. And when they recycle some hydrogen from the exhaust back into the engine, the composition of the product is close to their target. The team will soon pressurize the incoming fuel-air mixture to investigate performance when producing high-pressure exhaust (needed to avoid the expensive compressors). But even without that adjustment, they’re getting close to the product they need—with high productivity and without catalysts. A. Acocella, E. Lim, K. Cedrone, L. Bromberg, S. Seethamraju, and D. Cohn. “System and market analysis of methanol production using compact engine reformers.” Proceedings, ASME 2014 8th International Conference on Energy Sustainability and 12th Fuel Cell Science, Engineering, and Technology Conference. June 30–July 2, 2014.